You can now buy online currency for use in Zynga games like FarmVille at retail outlets like 7-Eleven and GameStop. Many players of FarmVille don't participate in purchasing items for their farm because they are uncomfortable sending credit card information over the interwaves. Also, it is difficult to give such virtual items or currency as a gift. Zynga has killed two birds with one stone by allowing users to purchase in-game currency at the following retail stores: 7-Eleven, Target, Best Buy and GameStop. That doesn't mean that every one of those stores will have the cards in stock so proceed with caution. 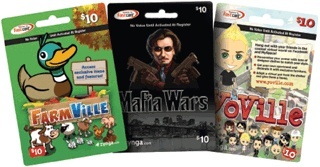 The pre-paid cards will come in $10 and $25 denominations and are available for the games FarmVille, Mafia Wars and YoVille. The cards are specific to the game, i.e. you can't use Mafia Wars cash in YoVille. You can redeem the cards directly on Facebook, or at zynga.com. At least I know what I'm buying my mother-in-law for Christmas this year.